“Not knowing Barcelona too well, but loving the short time that I’ve spent here, my perfect day would start by waking up with the sun shining through the curtains, warming my face and encouraging me to get up – rather than the English weather that just wants to make you curl up under the duvet and go back to sleep. I would have breakfast on his terrace before a stroll to Parc de la Ciutadella (the kids love the mammoth and playground) looking in the windows of all the fascinating shops along the way. 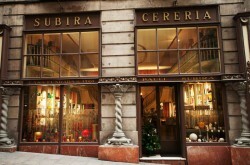 My favourite so far is Cereria Subirà, a candle shop located on Baixada de la Llibretería, 7. 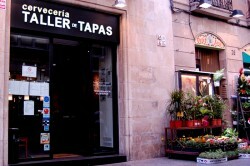 It dates back to 1761 and is the oldest establishment in Barcelona. The interior actually looks like something out of a western and the candles are certainly special. The trade’s main clientele had always been the Church, but both the appearance of electricity in the 1900’s and later changes in liturgy during the 60’s affected trade significantly. However, thanks to the arrival of magazines such as Marie Claire and Paris Match in Spain, which promoted the use of candles as decoration in the home, the future of the shop and the wax workers was secured. Next a long lunch with my family or any of Rob’s friends in a tapas restaurant. Kicking back and enjoying the relaxed pace of life. I love the idea of tapas; lots of small dishes to try and the ability to just keep ordering as you fancy it. Taller de Tapas, although a chain, hits the spot. Try the spinach with chickpeas and pancetta (espinacas con pancetta ibèrica y garbanzos). Delicious. I’d then wander home via an ice cream and coffee shop. This one is not exactly on the way home but if you can get to Vioko on Passeig de Joan de Borbó then they have some flavours I’m sure you won’t have seen before. I’ve never really got the whole siesta thing, but I’d give it a go … at least I’d relax for a couple of hours. That would be a treat in itself. 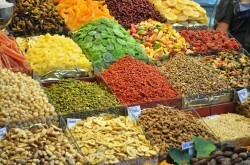 In the afternoon I might take a walk around the Boqueria which is a famous indoor food market. The colours and smells are amazing and the food looks fantastic. There are some very weird items – sheep stomachs, €200 Serrano ham and odd crustaceans as well as more normal fare such as assorted olives, huge strawberries and beautiful beef. Grab a stool and have a clara (which is basically beer with Fanta Lemon) at one of the tapas bars and maybe a fresh seafood platter. Julia lives in Surrey, England with her husband and three children – and is very envious of her brother’s Barcelona lifestyle. Must drop into the Cerería and Vioko! Great tips, thanks!